Pictured above: Belize is home to some impressive birds, such as toucans. You too can see a toucan in Belize. 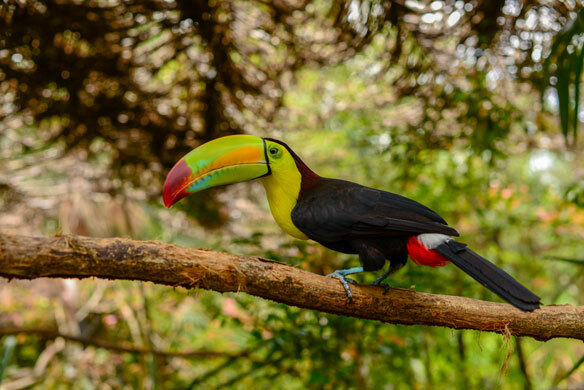 The ecology-minded country has protected more than 40% of its terrain from development, and that in turn has provided a shelter for a host of exotic birds such as toucans, says Deborah Gilharry of the Belize Tourism Board, the logo of which actually has a toucan on it. Some jungle hotels have recorded over a hundred species of birds within a one-mile radius of the properties, Gilharry says of guided birdwatching opportunities in a country that has large swathes of jungle. Gilharry adds that nature enthusiasts will be able to appreciate other sides to a country that is home to the world’s only jaguar sanctuary. Another attraction is what’s labelled a baboon sanctuary but which actually provides a home to howler monkeys, famed for their loud calls. But Gilharry adds that Belize also has plenty of beach and watersports opportunities. Gilharry adds that Belize is also home to many Maya archeological sites that tourists can visit, among them Caracol, which actually has the tallest structure in the country. Descendants of those who built the likes of Caracol can be found around the community of Punta Gorda, where Maya homestay programs offer day visits and overnight stays, with visitors able to learn the likes of how to make chocolate. “It’s very interesting, very authentic,” Gilharry says of those visits. “Anywhere you go in Belize, you can find Maya temples,” she continues. Belize can easily host the underwater-exploration crowd, with dive options including its famed Blue Hole, known for its eye-catching colour. Meanwhile, Gilharry is promoting her homeland as a great weddings venue, with options including Maya sites, beaches and even some of the caves that dot the interior of her country. Adventurous newlyweds going the cave route can actually overnight in one, having a catered subterranean experience. Tour operators that offer Belize include Air Canada Vacations and WestJet Vacations. Agents wanting to learn more about Belize can become a Belize specialist. More information is available at belizetourismboard.org.